The annual exercise of staring into our crystal balls and making predictions for the coming year has begun. I’ll leave the speculation on the headline-grabbing technologies — your blockchains and your dancing robots — to others. 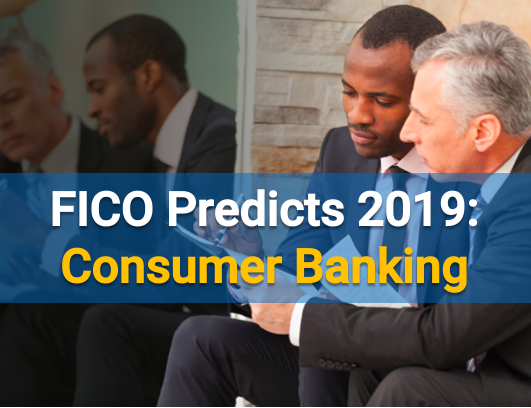 For my predictions, I’ll focus on four areas of tactical concern within consumer banking that I feel confident bank executives will make significant progress addressing 2019. In response to this competitive pressure, top 100 banks will invest in an area that has been neglected for too long — deposit pricing strategy. Sophisticated analytics tools, like optimization, and the ability to rapidly deploy the models developed by those tools will give banks the ability to deliver smarter, more granular pricing, enabling them to compete effectively in this increasingly frenetic environment. A majority of banks are undergoing digital transformations, ranging in scope from simple channel technology upgrades to massive enterprise re-platforming initiatives. The goal is to create modern, compelling customer journeys that will differentiate the organization from its competitors. In 2019, it will become increasingly clear that these transformation projects require more than just new technology, they also require significant organizational changes. Siloed business units and technology stacks for credit risk, marketing, fraud and compliance work extraordinarily well for maintaining the status quo, but poorly when it comes to large-scale transformation. Banks will increasingly recognize this and work to ameliorate the negative effects of silos as they shift from product-centric to customer-centric business strategies. Emerging payment solutions — mobile wallets and P2P payment networks most notably — are slowly but steadily displacing legacy payment options like cash and checks and cementing themselves in the day-to-day lives of consumers (particularly Millennials and Gen Zers). The introduction of faster payment rails, which are starting to replace antiquated clearing and settlement networks in the U.S. and Europe, will only accelerate this trend. However, the faster these new payments move, the more attention they will attract from criminals. To quote an executive at Varo Money, “fraud follows speed.” Emerging payment solutions will become more mature in 2019 as payments executives focus on educating their customers and adapting their fraud controls to compensate for this growing threat. We began to see a resurgence in small-dollar lending in 2018 with new regulatory guidance from the OCC and FDIC encouraging banks to compete with payday lenders. This regulatory green light will embolden bank product managers to think creatively in 2019 about how they can carve out a slice of the estimated $90 billion U.S. small-dollar lending market. Two recent developments will aid banks’ efforts to break into this market in the next 12 months. First, the widespread development of digital platforms for prime personal lending and DDA overdraft will give banks an automated, low-cost solution for underwriting small-dollar loans. This is critical to making the business case for small-dollar lending viable. Second, recent innovations in credit scoring — the inclusion of alternative payment data, the ability for consumers’ to supplement their scores with deposit data — will enable banks to safely and soundly widen the pool of credit for eligible customers to include a portion of the estimated 25-50 million consumers who take out payday loans today. I feel reasonably confident that banks will make substantial progress towards (if not completely fulfilling) my four predictions above. However, I also know that 2019 will be shaped by technological, regulatory and competitive developments that no one sees coming. As always, FICO stands ready to help your organization navigate our rapidly changing industry.